This is a recreated look I wore this past Friday. I woke up late and was in a rush (more than usual). When I’m in a rush, I always depend on Fyrinnae for quick and effortless pretty look. I didn’t use the Pixy Epoxy base when I go to work, but I did for this post. PE really helps the ‘glow’ of these shadows come through in pictures. *Pictures of these shadows are posted already. Run a search to view. I filled in my brows with the Mac crayon. I typically use Anastasia’s pencil during the day. I recently purchased this hoping it will show up better in pictures. The Anastasia pencil is better to the naked eye because it isn’t painfully obvious that I’ve filled them in. In photos, it doesn’t look like I’ve done much of anything. I used my go-to NARS shadow primer in my crease and up to my brow. I applied Tete-A-Tint on my crease and up to my brow bone with a Mac 217. I put on my highlight shade with a Mac 239 and blended it down. I then apply the Pixy Epoxy on my lid. With the same 239 brush, I pressed Fyrinnae’s Electric Stardust color into my brush and patted it on the inner two-thirds of my lid. 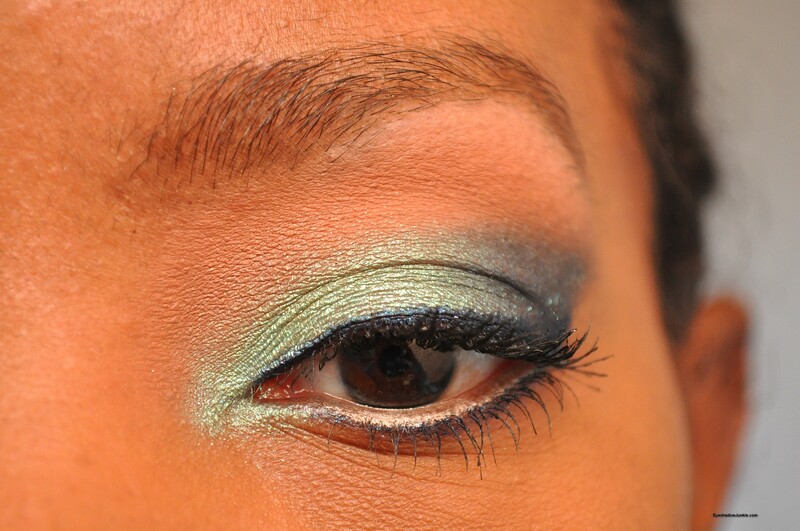 I concentrated the color on my lower lid and tapped it lightly up to my crease blending it in with Tete-A-Tint. Using the other side the 239, I lightly pressed the darker Fyrinnae shade onto my brush. I use the tip of the brush to create an angled outer edge and patted the color over to the light green. I took the 217 with a little more Tete-A-Tint and blended out the hard edges. Some of the color got wiped away so I repeated the application process with the lid shades. Although not shown in the pictures, I kept the rest of my face neutral. NARS Gilda blush is a coral shade. The lip color I chose is a rose-brown shade. My lips are extremely pigmented so the color looks brown with a hint of pink.